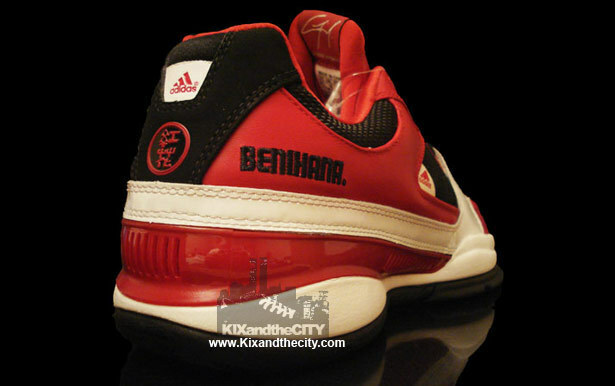 2008-09 – 2008 – The restaurant chain Benihana officially collaborates with Adidas on Gil II Zero “Hibachi” shoes for Wizards point guard Gilbert Arenas. Nicknamed Agent Zero, Arenas described his playing style with the term for a Japanese charcoal stove: “You just got burned. The arm is a hibachi. So when it gets hot, you can’t stop it. You’re getting cooked. You’re getting hibachi’d.” Only 1,000 pairs were made and sold exclusively in D.C., but Arenas never had the chance to wear the shoe on court. Ten years later, Arenas’ friend and Golden State Warrior Nick “Swaggy P” Young debuted the shoes in Game 3 of the 2018 Western Conference Finals.